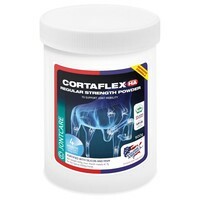 CortaFlex HA Regular Strength Powder for Horses is a unique formulation of the refined isolates of Chondroitin Sulphate and Glucosamine Sulphate, in a special blend designed to achieve exceptional assimilation and effectiveness in the promotion and maintenance of healthy joints. Excellent product. Witnessed good response in several horses. Used this product for 8 years on a horse with tendon injuries, he's now over 20 years old and still going strong!